A dishwasher not spraying water can be caused by multiple factors. It may be a blockage in the spray jets, overloaded with dishes, a blocked pump, float switch malfunction, water valve issue, or a water pressure problem. The below troubleshooting methods for a dishwasher not spraying water work with all dishwashers including Bosch, Frigidaire, GE, Kenmore, Kitchenaid, LG, Maytag, Samsung, and Whirlpool. Check This First! : Verify the dishwasher is getting water from the water supply valve on the wall, and the water supply valve on the dishwasher itself. What Causes a Dishwasher To Not Spray Water? 1. Spray arm is clogged. 4. Overfill float switch malfunction. This page will show how to troubleshoot your dishwaser yourself. 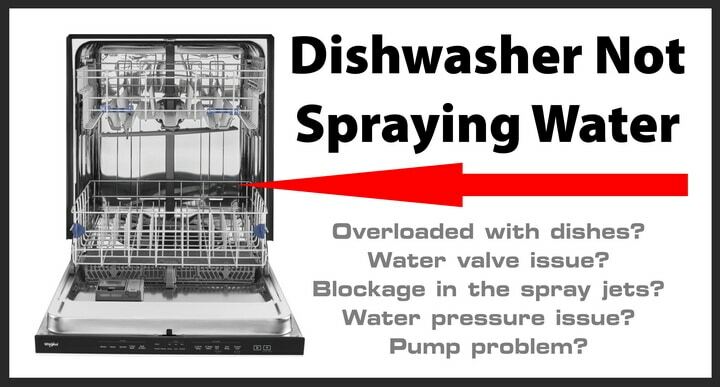 We will explain all the components that will cause a dishwashwer to not spray water. This will help you to repair the issue yourself. The spray arms can accumulate hard water in the jets. This causes water to not spray out with force therefore not cleaning your dishes. Be sure to clean the spray arms to remove the hard water that has built up. Use an object such as a toothpick or other tool to open up the water jets on the dishwasher spray arms. Be sure the spray arms on top and below are spinning properly. Spin them by hand to be sure they spin freely. If you find a spray arm to be unrepairable, it will need to be removed and replaced. 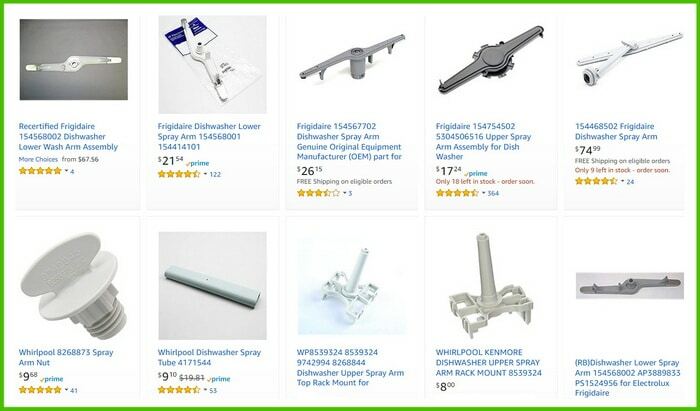 Below is how to remove and replace a dishwasher spray arm. Too many dishes jammed into the dishwasher can cause it to not spray and clean your dishes. If a dish or cup in the dishwasher is up too high, it can prevent the spray arm from spinning freely. Also, too many dishes can make it difficult for the dishwasher to efficiently clean all dishes. Rearrange or remove some dishes to remedy the issue. Check to be sure the pump filter is not clogged. The filter is located at the bottom of the dishwasher. Remove the filter and clean it under warm water. Anything that has broken (dishes/cups) or food particles can accumulate and clog the pump filter. If particles have gotten down into the dishwasher pump, it will need to be cleaned out. When the water fills the dishwasher, it turns off when it gets to a certain level. This is done by the overfill float switch. This device consists of a float and a microswitch. If the float is damaged or faulty, it may turn the water off and the dishwasher will not fill with water. Check this switch and adjust or replace if needed. Inspect the water valve on the wall (usually connected under the sink and to the hot water valve) to be sure it is OPEN. The water valve can be located by following the water line that comes out of the dishwasher. Check the water supply valve on the dishwasher. Be sure it is not clogged or leaking. The water supply valve is usually located on the left lower side under the front access panel. Your household water supply could be too low. Check to see if the water supply can fill a one quart jug within 9-10 seconds. If so the water pressure is good. Household water pressure needs to be from 20 to 120 PSI for appliances to work properly. We have seen some issues where the water valve outside of a home is not fully open. Check the water valve outside of your home to be sure it is fully open and functioning properly. Extra Step: Check the chopper area in the bottom of dishwasher for broken glass or other debris. If the food chopper cannot function, this can prevent it from spraying water through the spray arms. These repair methods work with all dishwashers including Bosch, Frigidaire, GE, Kenmore, Kitchenaid, LG, Maytag, Samsung, and Whirlpool. What is the best way to troubleshoot a dishwasher not spraying water? What parts or components need to be checked to get the dishwasher to spray water? Need assistance? Please leave your question below including your dishwasher model number and we will assist. Item number 3 looks reads very promissing until you go down, and the description is about the screen filter. Would a missing spray arm nut keep the unit from spraying during it’s cleaning cycle? We have hard water and used CLR to unclog the spray arms. I just don’t think removing hard water residue with a toothpick would be very effective.